All measurements in the detailed description of the birdie huts are approximate as these are all hand made. All the Birdie Huts are made from 100% prewashed high thread count quality cotton fabric. Soft white fleece lining inside and the base is made of plastic craft mesh. 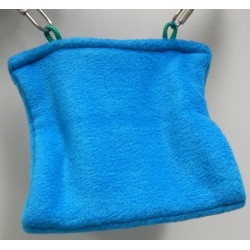 They are completely machine washable and can be dried on low heat setting or easily hand-washed and air dried. Every hut is stitched for maximum durability. 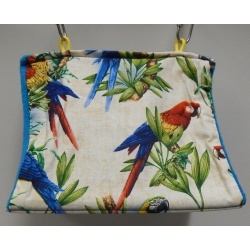 They can be hung in your birds cage with a simple wooden dowel or by using quick links. Quick links are included as shown. 5 X 6 1/2 X 10 in. approx. 3 X 5 X 5 in. approx. 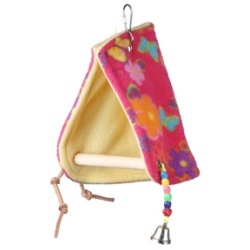 The Cozy Hideout has soft fleece lining inside and colorful patterns on the outside. This bird hut has some added features to it. There are solid plastic balls and rings with some rope to play with. Some extra entertainment with this hut! 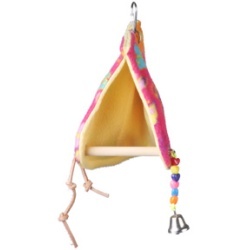 They can be hung in your birds cage with a simple wooden dowel or by using links. Links are included as shown. 10 X 6 1/2 X 7 in. approx. The Peekaboo Perch Tent will be sure to keep your angel nice and cozy and will also help them feel safe and secure. The tent is made with a very soft fleece material. The outside has a colorful pattern while the inside is calming yellow. The inside has a 3/4" dowel allowing them to easily go to the bathroom and not make a mess in the tent. It also has some pieces of leather to nibble on and some plastic hearts to play with and don't forget the bell to ring!! They can be hung in your birds cage with a quick link. Quick link is included. 11 L X 6 W in. approx. The Peekaboo Perch Tent will be sure to keep your angel nice and cozy and will also help them feel safe and secure. The tent is made with a very soft fleece material. The outside has a colorful pattern while the inside is calming yellow. The inside has a 1/2" dowel allowing them to easily go to the bathroom and not make a mess in the tent. It also has some pieces of leather to nibble on and some plastic hearts to play with and don't forget the bell to ring!! 10 L X 5 W in. approx. 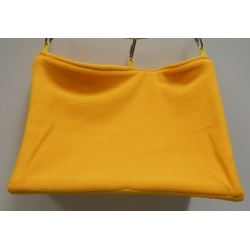 The Tradtional Snugglie has soft fleece lining inside. 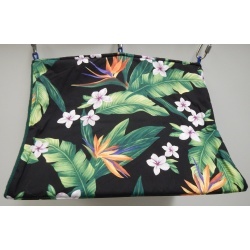 They are completely machine washable and can be dried on low heat setting or easily hand-washed and air dried. 9 X 8 1/2 X 13 in. approx. 4 X 3 1/2 X 5 in. approx. 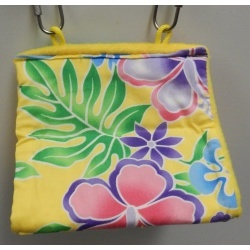 The Tropical Snugglie has soft fleece lining inside and colorful patterns on the outside. They are completely machine washable and can be dried on low heat setting or easily hand-washed and air dried. 4 1/2 X 4 1/4 X 7 in. approx. 4 1/2 X 4 X 5 in. approx.